This is a great electro track that I recently made. Perfect for your space action sequences, or anything else really... This track doesn't loop as it is. Check out the Techno Version:[link] If you would like a loopable version you can contact me via my website. I may use this for a small little game. The game is nothing special are large just for a class and public. It will be completely free. Just want to get the permission. 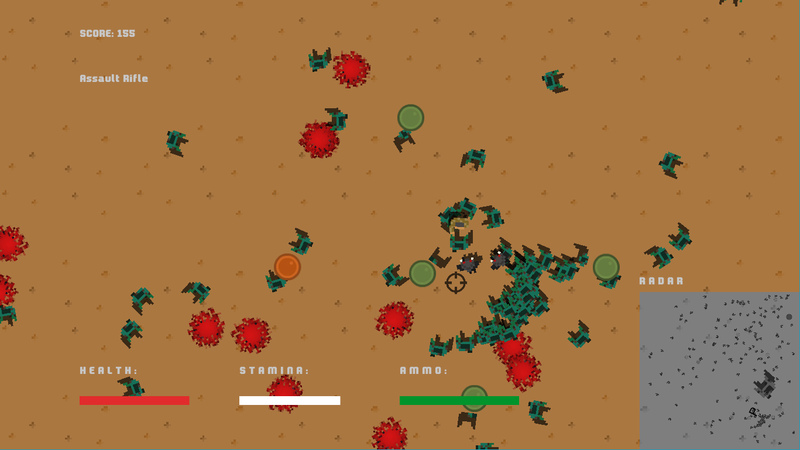 Here is a screenshot of the game to show that it is not complete rubbish and because the front page said we should post a preview of how the art will be used. Just image this music going along. I can give a demo of the program if you want. Woah! That looks awesome! Did you see the other electro tracks I uploaded as well? Those might fit your game. I'd love to play a demo. Thanks! The game is done with java using very limited opengl as those were the reqs for the class. I liked the non 8-bit better so this version has that as the music. This is nothing huge just a single room to run around in and kill stuff. Made the game in a week or so off and on. Your music BTW is freaking sweet. The song fits very well. I plan to add more rooms and a mech to pilot but classes are heavy. Thanks for letting me use the song. Credit will show on start up in the final version. No problem and thanks for the link. Hit me up on my e-mail, I would love to work with you sometime in the near future, your game is really cool! Also, I really think you should fully hash this game out it plays very well. I have enough music for this game to really go somewhere.